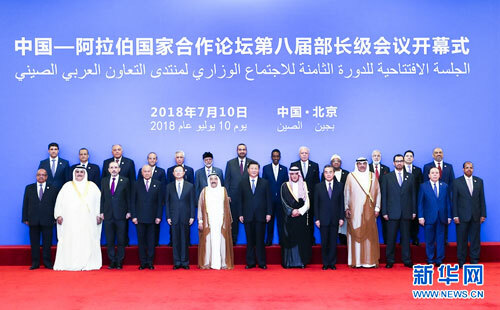 On July 10,Chinese President Xi Jinping delivered a speech at the opening ceremony of the eighth ministerial meeting of the China-Arab States Cooperation Forum Tuesday morning at the Great Hall of the People in Beijing. Xi announced that China and the Arab countries had agreed to establish a "Sino-Arab future-oriented strategic partnership of comprehensive cooperation and common development." 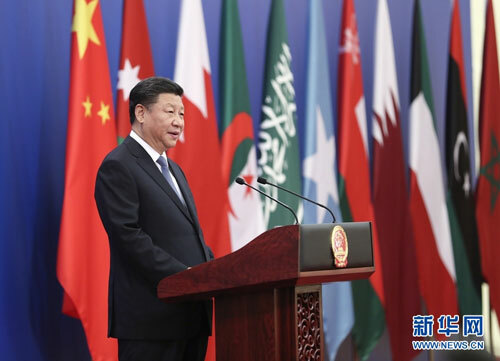 Calling the Arab states China's natural partners in Belt and Road cooperation, Xi said the cooperation had energized every dimension of Sino-Arab relations and propelled Sino-Arab all-round cooperation into a new phase. China stands ready to work with the Arab side to coordinate the development strategies and actions, Xi said. "We must strive to uphold peace and stability in the Middle East, safeguard fairness and justice, promote common development and learn from each other as friends do," Xi said. Xi said that China and the Arab states need to strengthen strategic trust, stay committed to dialogue and consultation, uphold the principle of sovereignty, champion inclusive reconciliation and fight terrorism. In terms of helping each other realize dreams of rejuvenation, China and Arab states must stay focused on connectivity, the energy cooperation needs to be driven by both oil and gas and low-carbon energy, and financial cooperation must go in tandem with collaboration on new and high technology, Xi stressed. Xi announced that China will set up a China-Arab states bank consortium. Xi also proposed the two sides to achieve win-win outcomes, noting that China is committed to deepening reforms in all respects, continuing its fundamental policy of opening-up and pursuing development with its door wide open. "China looks forward to the participation of Arab countries in the first China International Import Expo in Shanghai this November," he said. With the need to promote inclusiveness and mutual learning, Xi announced a series of policies to enhance mutual understanding between the Chinese and Arab people, and the official launch of a China-Arab press center. As important players in the international political arena, China and Arab states should make concerted efforts to find a new path toward full rejuvenation of the Middle East, Xi said. Xi stressed the importance to respect the different national circumstances of regional countries and their independent choices, and uphold the principles of treating each other as equals and seeking common ground while setting aside differences. "We must together pursue common, comprehensive, cooperative and sustainable security," Xi said. He also expressed his hope that all relevant parties could abide by international consensus and handle issues related to Palestine in an impartial way. "It is imperative to build on the two-state solution and the Arab Peace Initiative, and bring the Palestine-Israel peace talks out of the impasse as soon as possible," Xi said. Xi also called on the two sides to work tirelessly toward the goals of rejuvenating two great nations and building a China-Arab community with converging interests and a shared future. After Xi's speech, Kuwaiti Emir Sheikh Sabah Al-Ahmad Al-Jaber Al-Sabah, Saudi Foreign Minister Adel bin Ahmed Al-Jubeir and Arab League Secretary General Ahmed Aboul-Gheit delivered speeches. Hailing traditional friendship and cooperation potential, they said the Arab states would collectively participate in the Belt and Road, and expressed agreement with Xi's notion of "building a community with a shared future for China and the Arab states, as well as for mankind." Calling China a trustworthy partner, they spoke highly of China's adherence to the purposes and principles of the UN Charter, and its important role in international affairs. As the Middle East was confronted with severe challenges in peace and stability, the Arab side expected to strengthen communication and coordination with China to jointly promote the peace and stability as well as development and prosperity in the region.